I was welcomed with a smile and was invited to sit on one of the tables which they call “mesob”, made of colorful straw and following the traditional style which have a lid that opens only at lunchtime. Opening the menu was a discovery in itself. I could see meat options as well as vegetarian ones. What most attracted me was the “menu de degustation” which offered a selection of dishes. The menu is served on Ethiopia’s typical bread called injeera, like a big (but thin) pancake. On this pancake you will find a small sample of various dishes they offer, like for example “Aib”, fresh cheese with a special dressing which is slightly spicy or “Segawot”, strips of stewed veal in onion and tomato jam. In Ethiopia, and in this restaurant too, it is a custom to eat with your hands (preferably with the right) and without using any cutlery. It is also a sign of respect and affection to feed another person at the table. 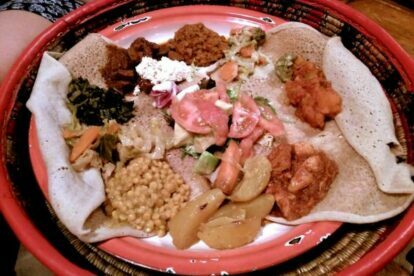 So grab a slice of injeera and take a bite of the Ethiopian treats that will take you for a whole gastronomical experience!